According to the American Academy of Allergy, Asthma and Immunology, almost 15 percent of people in the United States experience some type of allergic reaction to pets such as cats or dogs. The primary cause of such allergies is pet dander—the dead skin cells cats and dogs shed on a daily basis. If you are allergic to cats, you may experience a variety of symptoms that you may notice immediately or several hours after interacting with a cat. Some individuals experience allergy symptoms after touching or playing closely with a cat, while others may not be able to be in the same room as a cat without experiencing allergy symptoms. You may find that your nasal passages become congested when you are around cats. Some people may also sneeze or sniffle when in the presence of a cat. If these symptoms sound familiar, it may be helpful to keep a box of tissues handy to help you deal with these symptoms while you spend time with a cat. You may experience itchy, red or watery eyes. 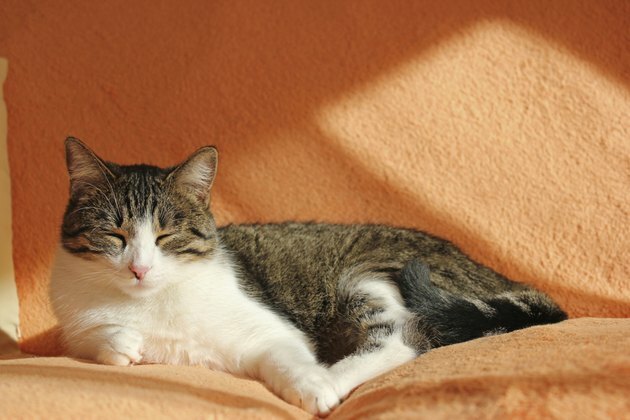 This occurs when the cat dander--which can float throughout the air--comes in contact with your eyes. You may find that you frequently rub your eyes to alleviate the itching. While this may provide some relief, you may actually be putting more allergen into your eyes by touching your eyes with your hands. Allergen-specific eye drops may provide some relief for these symptoms. Wash your hands after playing with a cat, as this can help remove excess pet dander from your hands. If you have a severe allergy to cats, or if you have asthma, you may find that you have difficulty breathing when in the same room with a cat. If you have asthma that is aggravated by cat dander, you may experience coughing, wheezing, shortness of breath, or tightness and pain in your chest. If these symptoms occur, you may need to find a clean space away from the cat until these symptoms subside. This is especially important to do if these symptoms are experienced by young children in order to prevent a severe asthma attack from developing. The best option to alleviate such symptoms may involve not having a cat as a pet. However, if this is not an option, consider limiting where your cat is allowed to wander throughout your home. Vacuum on a regular basis and install a HEPA filter in your home to limit the flow of cat dander. You may find that you skin becomes irritated when you touch or play with a cat. Depending on the severity of your cat allergy, you may develop hives or eczema on your skin. These conditions can lead to itchy, dry skin. Washing your hands after playing with a cat may help prevent these symptoms from occurring. However, if these symptoms arise, you may need to take an antihistamine to alleviate your discomfort.